Brooklyn neighbors are celebrating hot summer days again with the famous Brooklyn Park water slide. After much planning and fund-raising, the neighborhood has brought back the popular Brooklyn Park Summer Program, with longtime director Craig Montag still at the helm. The park program was lost to neighborhood kids last year, due to program cutbacks at Portland Parks & Recreation [see article in THE BEE, March, 2018]. Brooklyn neighbors worked hard through the nonprofit "Friends of Brooklyn Park" to re-establish the popular decades-old children's program, through business and private donations. Questions about it can be directed to Ben Tarne, "FoBP" Chair, at 971/772-6578. The revived summer program is open four days a week: Monday, Tuesday, Thursday, and Friday, from 12 noon till 8 p.m. Montag's supplies were stored in the Park Shack during the interim, until the program could be restored with resident funding. Montag, and his partner Miranda Roso, monitor the hundreds of youngsters who enjoy card and memory games, plaster crafts, lawn golf, basketball, and other long-time established activities in Brooklyn's park. Parents and youthful volunteers also pitch in to help where needed, providing an opportunity to develop community pride and youth responsibilities during the eight-week run of the program (June 18-August 24). 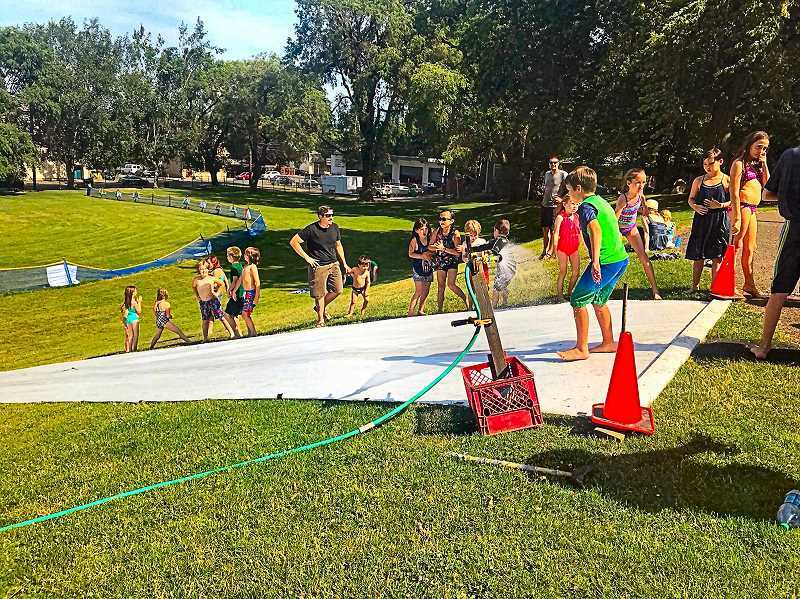 The large sheet of flexible plastic that comprises the water slide was donated by neighbor Michael Robirds, and the water for it is donated by neighbor Jim Houser. The slide is brought out when temperatures pass 90 degrees. Helpers lay out and stretch the plastic down the park's hill, deploy the water hose, and keep kids in an orderly line to await their turns. Montag, a retired teacher, has been a neighborhood icon for 40 years, and has watched as many of the "Park Kids" grew up, had children of their own, and returned with them to enjoy the program that was such an important part of their own summers past.